Search Engine Optimisation or SEO is the process of optimising a website to rank on top of the search engine results pages for highly targeted keywords (search queries that potential customers key in to find your products and services). Organic search traffic is ranked one of the most effective digital marketing channels when it comes to converting qualified prospects into paying customers – Marketing Land and in Singapore, Google has over 90% of marketshare among other popular search engines such as Bing and Yahoo!. This intensive 2-day Search Engine Optimisation (SEO) Training course covers the most up-to-date search marketing strategies and how to implement them to your existing businesses. To better facilitate the learning, each participant will be provided with a demo website for practical sessions on keyword research, on-page optimisation, and link building. Participants will also have the opportunity to work on their own websites should they choose to. In order to reinforce the concepts learned, participants will participate in live exercises, group discussions, role-playing, Q&A sessions, and undertake interactive quizzes. By the end of the course, participants will take away actionable SEO strategies that will enable them to manage their own SEO campaigns, be able to spot any tell-tale signs of a third party SEO vendor should hiring one be necessary, and oversee SEO campaigns as an SEO head. Unfamiliar with any SEO terms mentioned here? Check out our A-Z SEO Glossary of Terms & Definitions. Be able to conduct extensive and effective keyword research. Understand and be able to implement white-hat on-page optimisation techniques. Know how to identify link building opportunities and be able to implement them to existing Search Engine Optimisation campaigns. Know how to use various SEO tools to conduct competitive SEO analysis. Be able to create ROI-focused SEO campaigns. Be able to optimize a website locally and internationally. Be well-versed in the concepts of SEO, the correct methodology and processes required in place. Be able to oversee and manage Search Engine Optimisation campaigns in-house or through an agency. A SkillsFuture WSQ Statement of Attainment (SOA) – ICT-SNM-3006-1.1 Integrated Marketing under the National Infocomm Competency Framework (NICF) and Certification of Completion by Equinet Academy will be awarded to candidates who have demonstrated competency in the WSQ Search Engine Optimisation (SEO) assessment and achieved at least 75% attendance. Marketing professionals, Web developers, Content developers, and Marketing managers who are required to understand how search engines work in order to manage SEO campaigns and oversee SEO vendors, as well as how to develop/optimize content and webpages to increase search rankings. ▷ Social media signals – do they matter? “All the techniques and strategies taught by Dylan culminated into a mega case study on the second day of the course. In the case study, the students were hired as SEO consultants and urged to execute both on-page and off-page SEO strategies. During the sharing by each group, you could tell that Dylan was a very proud instructor who had just taught his class well. Most importantly, Heartland Boy thinks the best endorsement of Dylan’s competency is Equinet Academy consistent ability to rank in the top 3 of Google search engine for the relevant keywords. Dylan is the Founder, Marketing Director, and Director of Training of Equinet Academy. Throughout his career as a Search Marketing Specialist, he audited over 300+ SEO/SEM campaigns, conducted SEO classes for over 1500+ trainees, and provided consultancy to dozens of Small Medium Enterprises, Global Brands, Academic Institutions, and Government Organisations across the Infocomms, Travel, Hotel, Retail, eCommerce and B2B & B2C industries. Some of his clients include DHL, Fuji Xerox Asia Pacific, Microsoft, Emmerson, Singhealth, and Singtel. During his previous role as a Search Marketing Consultant, he facilitated the SEO site revamp and migration for SingHealth (Singapore’s largest academic medical centre) HealthXchange web portal, a content hub for trusted health tips tailored for Asia, while successfully maintaining the web portal’s search engine ranking positions on Google. Traffic volume increased by over 100% within a year after the successful revamp. He currently manages digital marketing campaigns for several companies in Asia, all consistently generating online leads and observing stable profit growth. Dylan is also a certified adult educator with the WSQ Advanced Certificate in Training and Assessment (ACTA) and certified curriculum developer with the WSQ Diploma in Adult and Continuing Education (DACE), awarded by the Institute of Adult Learning (IAL), previously an institute under SkillsFuture Singapore (Formally WDA) and now an autonomous institute within the Singapore University of Social Sciences (SUSS). He is a dedicated trainer and curriculum developer who prides himself in delivering quality training to ensure learners take away applicable knowledge and skills they can immediately put to action. Search Engine Optimisation (SEO) is the process of optimising a website to rank prominently on the organic search results. According to a research conducted by Forrester, close to three quarters (71%) of consumers start their purchase journey with search and 74% use a search engine during the consideration and purchase stages. If you’re not ranking on top of the search engine results pages, you’re not only missing out on key consumer-brand touch points that could lead to conversions and sales, you’re also losing customers to your competitors everyday. The main difference between SEO and SEM is that SEO (Search Engine Optimisation) is optimising your website to rank on the organic or non-paid search engine results and SEM (Search Engine Marketing) is paying to rank your website on the paid search engine results. If you want to learn how to develop and execute SEM campaigns, check out our Google Ads Fundamentals Certification course. In summary, what will I learn/achieve from attending this SEO course? Can I really rank no.1 on Google after completing this course? Yes, it is highly possible to rank on the first page of Google for multiple target keywords if you apply the strategies and tactics taught. 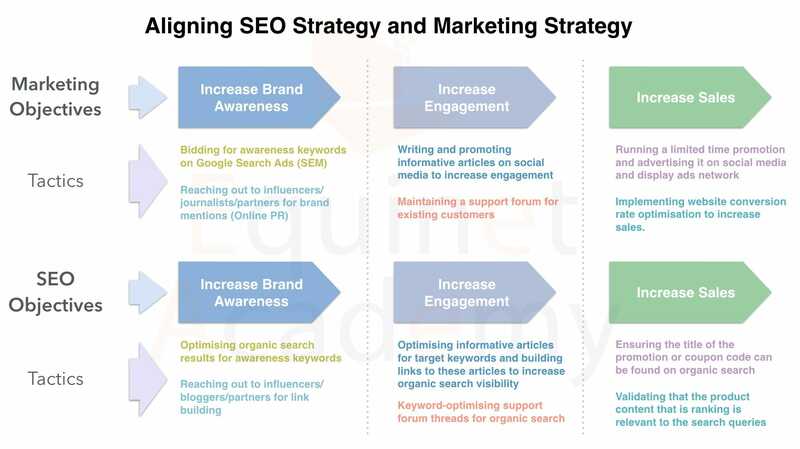 More importantly however, is knowing which keywords to rank for i.e. keywords that generate the highest return on investment (ROI). This course will teach you how to research, curate, and rank your organisation’s website for keywords that matter. Many of our trainees from SMEs and small business owners to MNCs and government organisations have increased their overall website rankings for their target keywords after applying the strategies and tactics learnt from this course. This course is suitable for Marketing Professionals, Web Developers, Content Developers, and Marketing Managers who are required to understand how search engines work in order to manage SEO campaigns and oversee SEO vendors, as well as how to develop/optimise content and webpages to increase organic search rankings. I am not a technical person. Can I still attend this course? Yes. You will wear the hat of an SEO Head/Manager. Even though a tad of advanced web development coding theory will be covered, you will fundamentally learn how to diagnose any technical SEO issues and know who to look for to rectify the issues regardless. No hard coding will be involved. However, you should at least possess basic computer skills (able to browse/surf the web, open files and documents, navigate simple tools/software). What courses should I progress to after attending this course? That depends on your business objectives. Take this 3-question survey to help you decide! If you are unsure whether SEO is the right channel for your business at this point of time, we recommend attending our Digital Marketing Strategy course to gain a clearer understanding of the various digital marketing channels and the impact of each channel on your marketing strategy. How is this course different from other SEO courses in the market? You will be guided by an experienced professional in the field of SEO in class, who will be able to provide you with actionable advice and costly mistakes to avoid, thus shortening your learning curve. We provide you with life-time access to up-to-date course materials (learner’s guide, slides, templates, and other training resources) via our learning portal. You will get to work on your own website’s SEO campaign in class, or otherwise a demo website if you do not own one. If I have specific questions relating to my website’s SEO campaigns, can I consult the trainer? Yes! Our trainers are dedicated practitioners who strive to ensure you gain significant value from the training. You may consult your trainer during and after class. More details on after-training support here. It is recommended to have a website you own or manage before attending this course in order to better contextualise and relate to the concepts taught. Furthermore, there will be time allocated to hands-on activities that will be based on your own industry. If you do not have an existing website however, we will provide you with a demo website. Are there any funding or government subsidies for this course? Yes, please see fees and funding section below or use the funding calculator tool. Check eligible grant amount and nett payable course fees via the grant calculator.